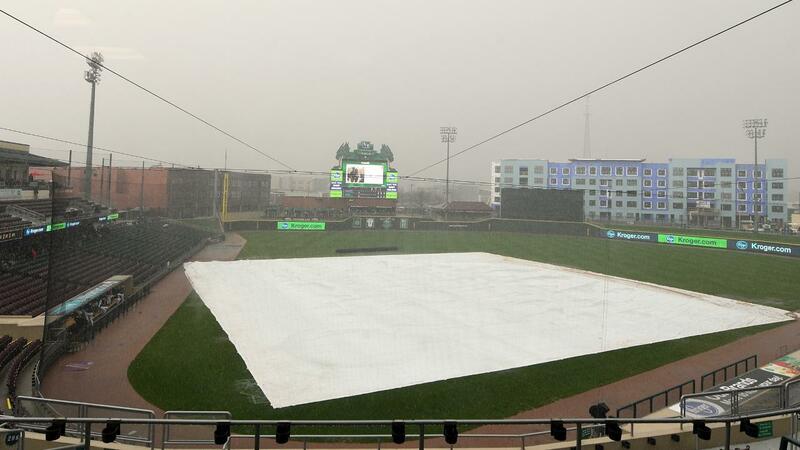 Dayton, Ohio-The Dayton Dragons and Lake County Captains were suspended by rain in the second inning on Sunday afternoon at Fifth Third Field. The game was scoreless with Lake County batting in the top of the second inning when heavy rain forced a lengthy delay and eventual decision by league umpires to suspend the contest. It will resume during the next visit by the Captains to Dayton. Lake County will come to Dayton for a four-game series May 20-23. Exact date and time for the resumption of the suspended game will be announced in the coming days. Fans with tickets to Sunday's suspended game should contact the Dragons for ticket exchange options. Up Next: The Dragons (3-7) remain home and open a new three-game series against the Fort Wayne TinCaps on Monday at 7:00 p.m. at Fifth Third Field. Jacob Heatherly (0-1, 12.27) will start for Dayton against Fort Wayne's Angel Acevedo (0-0, 2.57). On the Air: All Dragons games are broadcast on radio on Fox Sports 980 WONE AM. Games can be heard on smart phones, iPads, and other mobile devices via the free Dragons Mobile App, or on a computer at wone.com. Games are also available on HD Radio on 104.7 WTUI HD 2. All Saturday and Sunday home games are televised on Dayton's CW (channel 26; Spectrum cable channels 13 and 1013).